Hi, my name is See More Rocks. That's the name I got when I was born with. It was my racing name - except I never raced - couldn't be bothered with that. Seemorerocks is also Robin's nom de plume. He prefers to call me Biscuit and Pam calls me Wisk (and a host of other names - but then consistency wasn't ever her first name!). So from now on I'll call myself Biscuit. Robin asked me to provide a history. I don't know what that is but I'll describe my life at the farm. Life's pretty sweet at the moment. Plenty of space and food's good. 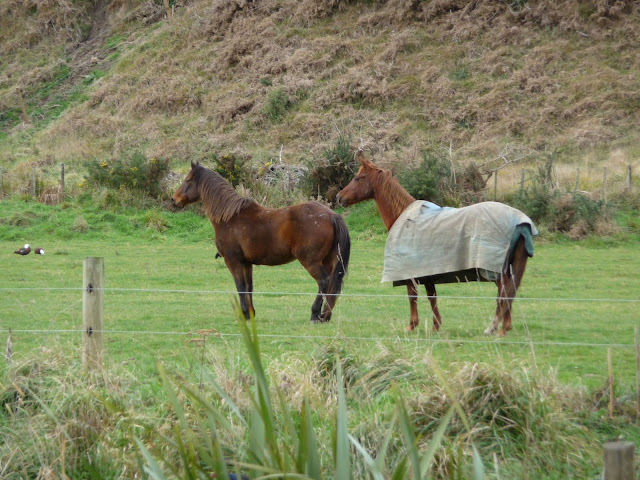 I live with 10 other horses although they keep getting moved around so I don't always see them all at the same time. I guess Robin and Pam don't have that much money because we don't have covers on (some of the others seem to have several). They don't get anyone to nail metal shoes on (although Robin is constantly lifting my feet and fiddling around with them). They practice something called 'natural horsemanship' - something about learning our language. Bit of a joke really because it doesn't matter how much they try, they'll never be horses! Never mind, we do have fun with them. I guess they are showing that they love us and care. They walk up to the top of the hill to get us (sometimes we make them walk quite a long way) and bring us down to their area across the stream where they brush us down. I really do love that brushing especially the feeling on my face! Sometimes we just hang out with them. Other times they saddle them up and we get to go out. We... I almost forgot to mention Lucy. 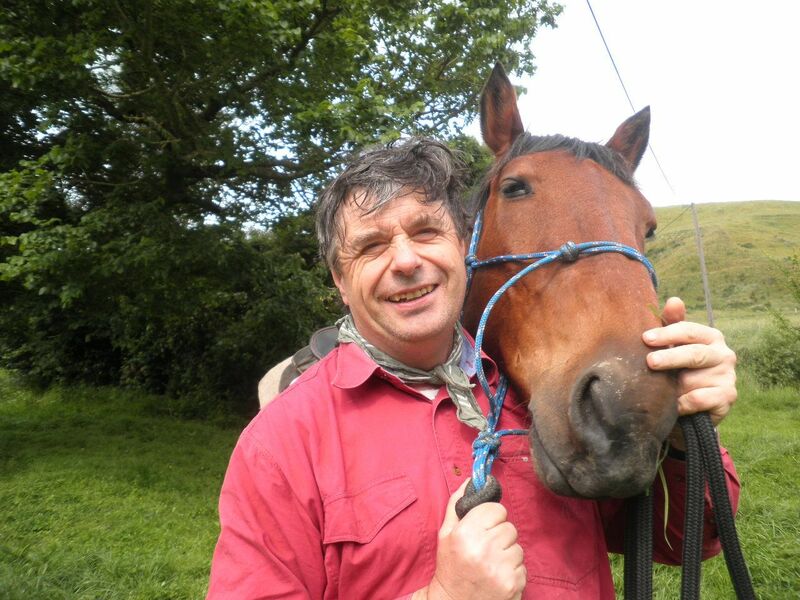 I had another girlfriend, Poppy but she went over to the horse ancestors - I was pretty sad over that one. 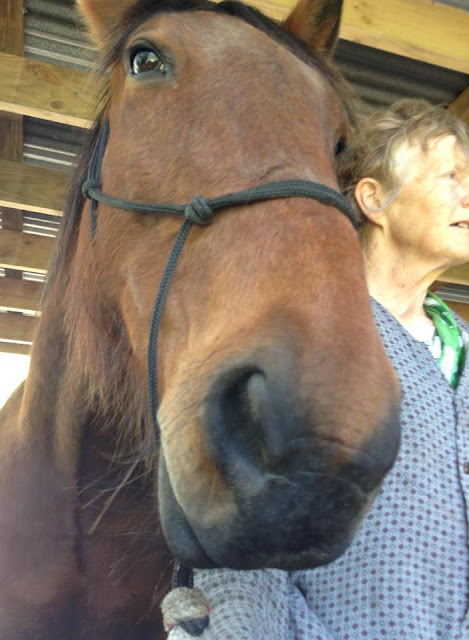 Lucy is a long distant relative (they call us standardbreds) and she's great to have around. But I have to tell you that I'm boss and I have to take action if she (or any other horse for that matter) gets too close. Mr. Grumpy they call me! Lucy looks to me and won't go anywhere with her human on her back without me. We used to go out a lot more which involved getting on a big box on wheels. It's dark and restricted and I feel claustrophobic so I've had to work on that one. However we have had some pretty good outings including events with lots of other horses where we get to run over the hills. Pretty cool. However we really haven't done so much recently. Pam was pretty sore and not that comfortable for Lucy to carry and Robin came off my back because some bit of the saddle snapped and he hurt himself (but I got the saddle off myself). He hasn't seemed himself recently. He's pretty much able to be depended on and means really well but I look after him. Next time I'll talk about some of my paddock mates. I wonder when they'll be out next. I could do with an apple! Hey, that's Tane on the left. He's my equal. Perry,on the right, is below me. Looks as if the've seen something! Tane came from out of the Kaiwakas and is bit of a wild boy. 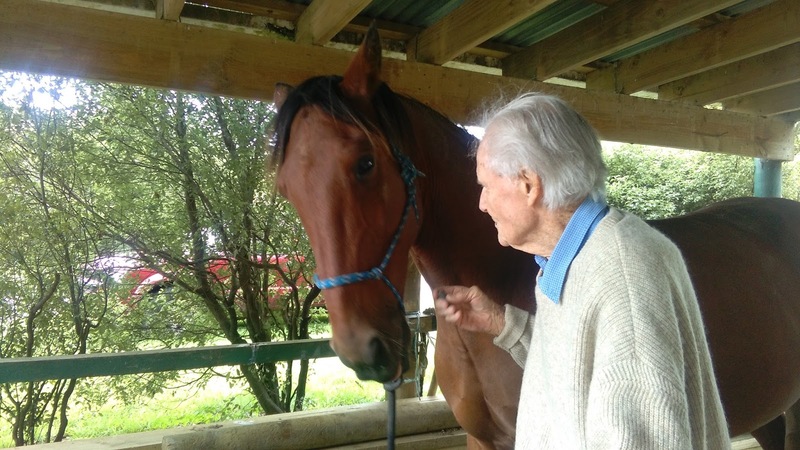 He looks after the old boy, Perry who was in his time a pretty good racehorse. Now he's older and got arthritis. They've since been joined by Danny, another racehorse who came because he had bad feet - he's also beneath me in the herd. 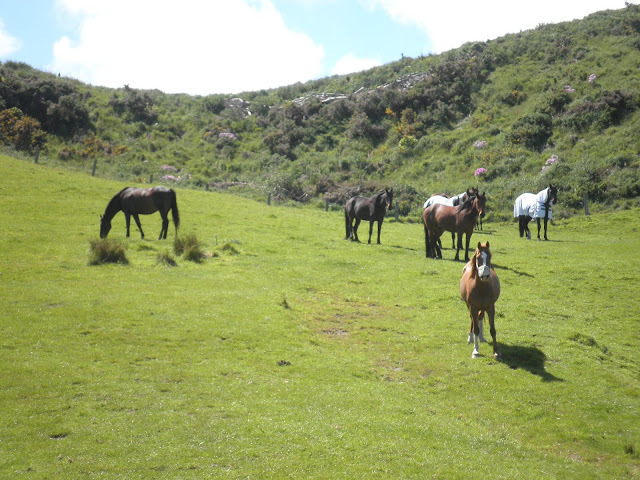 Come to think of it, they're just about all below me in the herd - except for Draachen the warmblood. It took quite a while for us to work out our place at the top of the herd but now he's my best mate - along wth Gelly who is joned to Draachen at the hip. So the four of us - me, Draachen, Gelly and Lucy we form a group of out own. Here is Robin riding me round the paddock. He's doing alright but I'm pretty good at working out what he wants! One day Lucy and I spent the day with Robin and Pam. 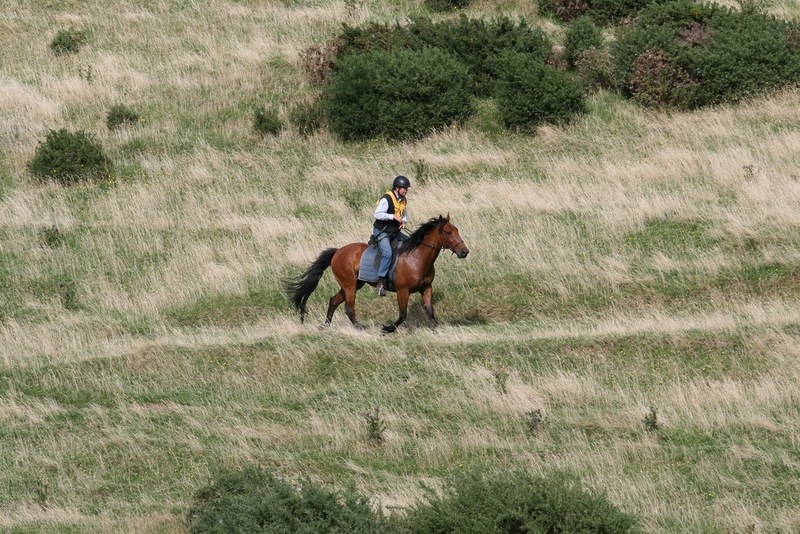 We were brought down off the hill, saddled up and taken for an outing into the hills. The best part was the feed at the end of the ride! I'm not sure about some of the riders - but we Standardbreds certainly CAN! It is time I provided you folks out there with an update. Life on the farm continues much as it always does. There is plenty to eat, especially with the goodies Pam and Robin bring for us. There has been a death on the farm (Tane died suddenly last year. And then there are the constant comings and goings. It seems every time I make a girlfriend they are goiug to be taken away from me. My constant companions are my best friends - Draachen (Magellan was taken away and replaced with the wipper-snapper, Soren), the old-timer Perry and his keeper, Danny - and Lucy. A couple of years ago Robin fell off my back and broke his arm. He hasn't been the same since. We used to go all sorts of places and we had many adventure together. But he doesn't seem that well of late and I get a bit worried when I can't pick him up on my radar. 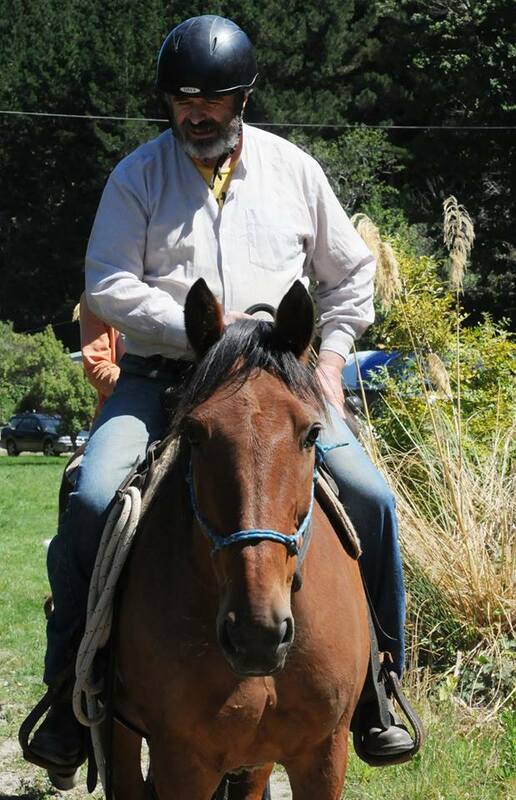 But he always seems to turn up and sometimes rides me. We never go far but occasionally we have a bit of a run on the tops. He's shown me how to do things I never dreamt I could - like rotating in tight circles and walking sideways. Lucy tells me I've got an obstinate streak - but we got there. Robin tries his best understand (unlike some humans who only know how to shout at us horses with their kicks and their pulls. So I'm grateful for that and hope I let him know. It ain't that easy carrying him these days, but I give it a go. 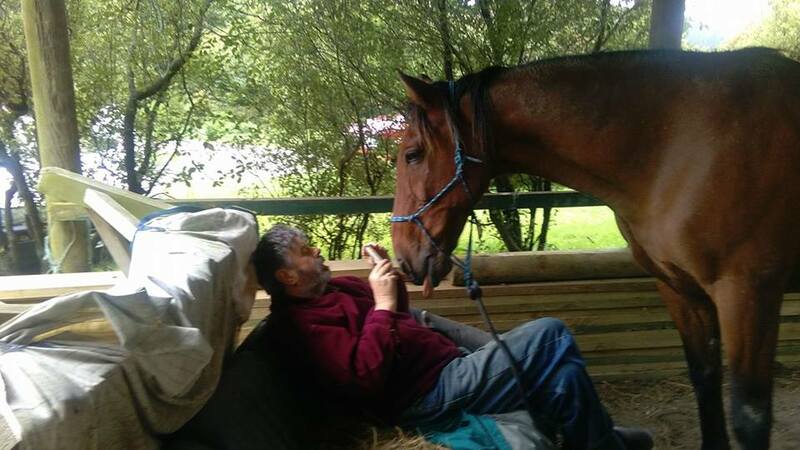 Pam is learning how to talk to Lucy and is making strides after she took us off in that big wooden thing on wheels and we spent 3 days with strange horses. She can be a bit of a slow learner, which frustrates Lucy. But we horses are grateful for the slightest progress. The thing I love most about Pam is she rubs me behind my ears. I LOVE that! She comes up the hill to fetch Lucy and I.
Oh! One other thing before I forget! 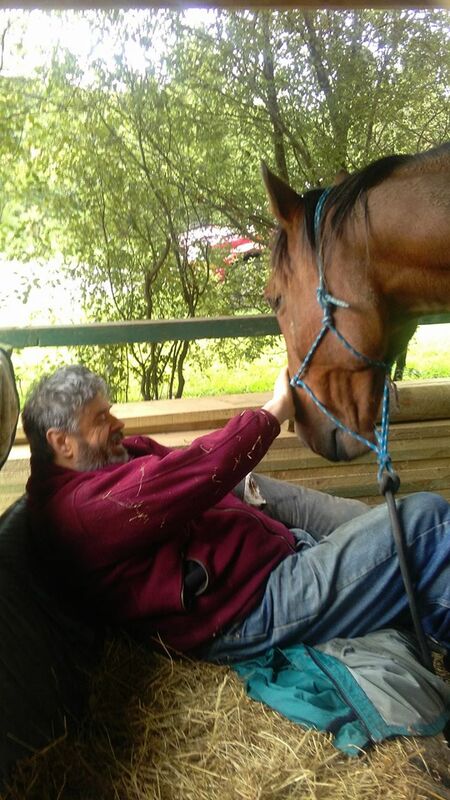 Pam had a friend, Brent come over with his horse, Jasper. Imagine the excitement when it turned out that Jasper is Lucy's foal. Lucy was beside herself with excitement - sniffed him all over. Enough. Back to the paddock. In these difficult days it is important to come back to the heart and what better way than through our relationship with our animal friends. What I like about Robin is, although he does silly things he is always ready to learn. A while ago he took me somewhere in the big box with my wife Poppy. We were offloaded and Poppy was put in a pen and I was taken off for what they call a 'lesson' (imagine that!). Poppy called out to me and I called back. 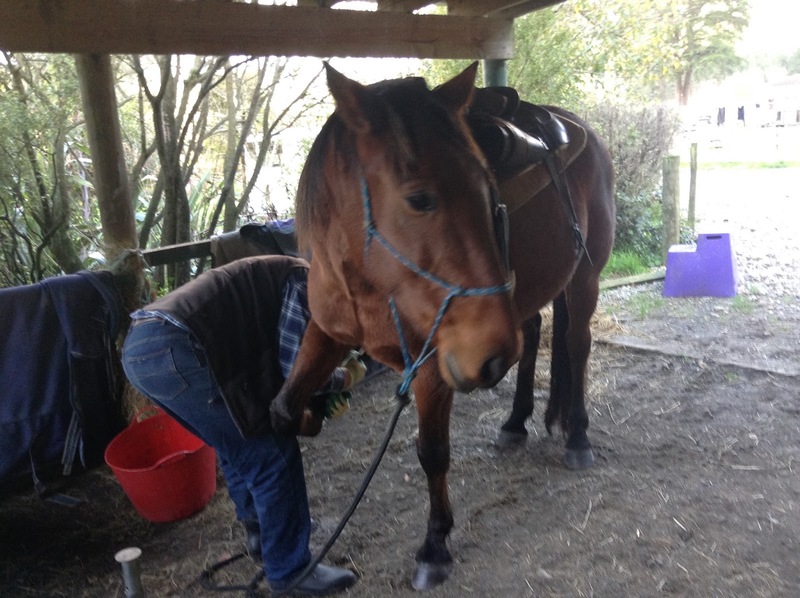 I was feeling very restless but the "teacher" wanted me to stand still while Robin got on. Every time I moved off I was made to do turns on my hindquarters - something I had always done with pleasure to please Robin. But this was punishment. 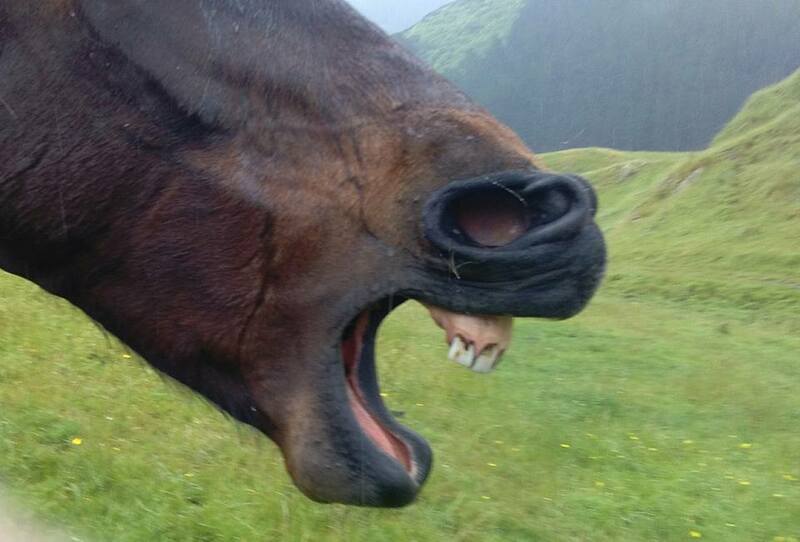 I was even told I was a bad horse by the man. After that I wasn't going to do those circles again. Not until Robin learnt a thing or two from me. I refused and kept refusing until the day Robin got it (those humans are such slow learners!). He touched me with his leg and touched the rein on one side. To reward him I did what he wanted, and since then he has tried to be gentle with me. Later on - after Poppy rejoined the horse spirits - we were riding out in the hills. I had to shift my weight and Robin lost his balance and the thing that holds the saddle in place snapped and Robin was catapulted onto the ground. He was badly hurt - I knew that . Once I shook the saddle off I walked off a little way to regain my composure - and have some grass. Somehow Robin got up and led me down the hill. He had a broken arm so we didn't go out for a long time. One day he came out and he was determined that he was going to take me out for a ride. But I could tell - as he led me down the hill that he was losing his confidence. He still thought that he was going to ride me. I hate it when humans lie to themselves, so I showed him that it was simply impossible. He brought out the saddle and tried to put it on me. There was no way he was going to get that thing on me! Luckily he got the message and he fed me and returned me to the herd. 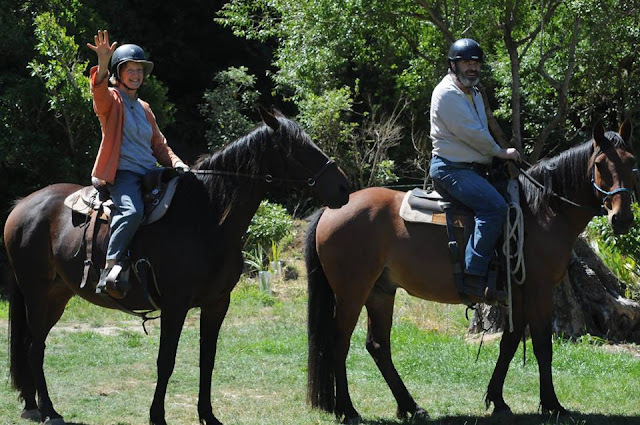 Once I got to know Biscuit (and myself), I have tried to find a different relationship with my horse - one based on partnership and not on fear or force. He has taught me so much about communication and softness. In return I have been able to offer something to Biscuit. 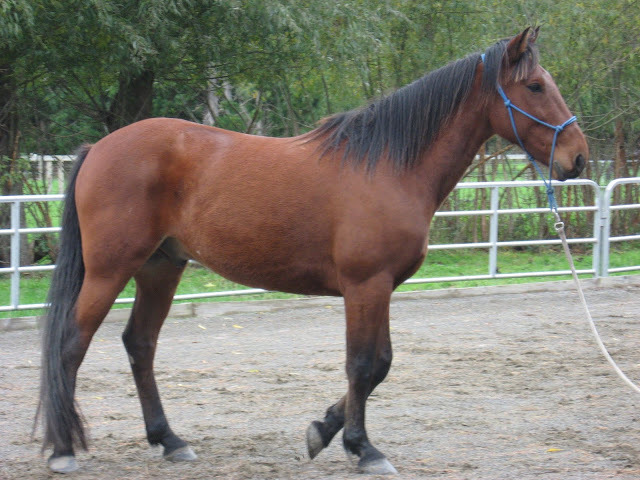 From a nervous and inconfident horse he has come into his own - he has become a dominant in the herd and happy and confident in himself. As a standardbred pacer he came with an impediment. 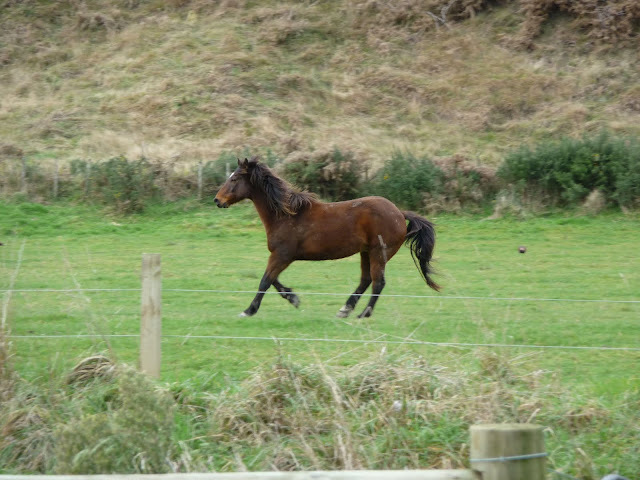 In short he had to learn to run freely and to move his feet in a coherent way. 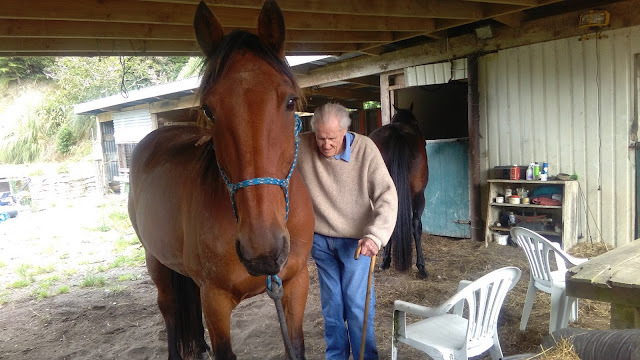 I have been able to demonstrate to him, with fairly minimal help of other natural horsemanship trainers that he can do things that he couldn't do previously. His pride in himself when now he rotates freely on his hind quarters or does half-passes, is palpable. He thinks (and is) he is a fine fella! I have been strongly indebted to what I have learnt (from afar) about softness and partnership from Mark Rashid. 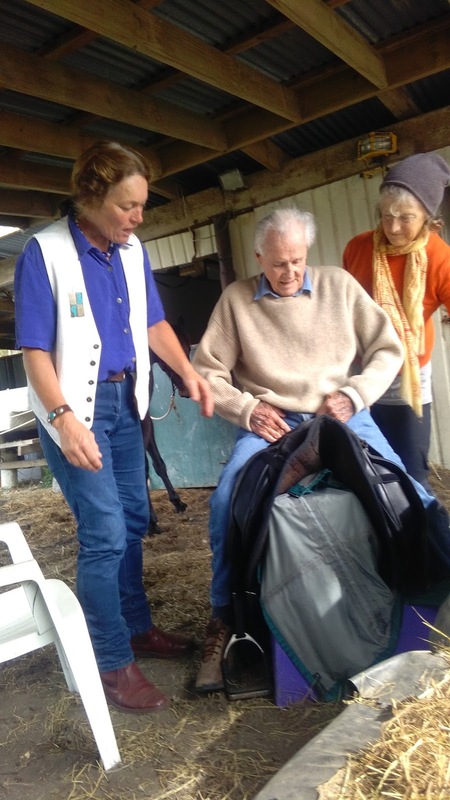 More recently my partner Pam and I have learned a lot from attending workshops with trainer, Steve Halfpenny from Adelaide, Australia. Formerly a level 3 Parelli trainer he has now fully embraced the Vaquero tradition of horsemanship, from which most contemporary natural horsemanship in America, is descended. When I started off with all this there was very little on the net about this traditional style of riding (that traces its origins back to Spain and working with cattle). When I looked today there are lots and lots of videos with demonstrations and lessons. Robin and I used to get out for many adventures, sometimes in the hills - first with Poppy, and then with my new partner, Lucy. 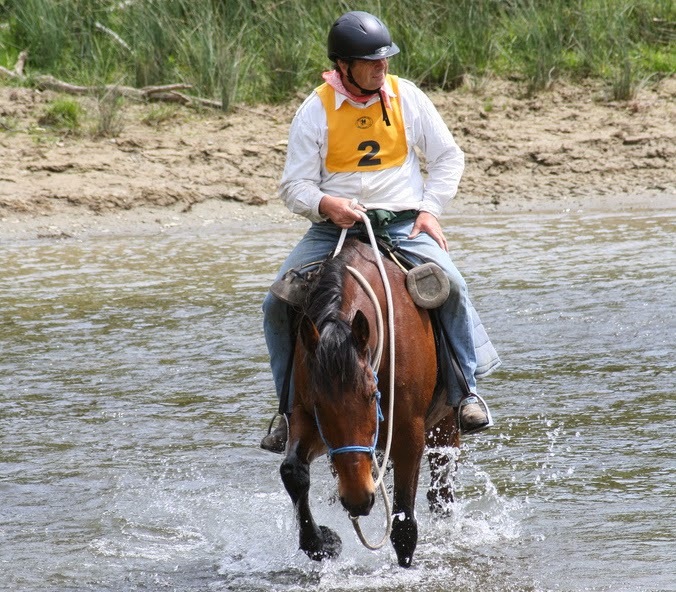 Sometimes we took part in competitions - competitive trail riding in places a long way from my paddock. That meant getting into the big box, (which is not something I feel that great about) and travelling long distances. Those days have passed but I still spend many happy hours with him and Pam. Robin is always happier with me than he is when he arrives. I love to see him happy. Breaking my arm was a trauma that I've never recovered from. It acted as a trauma that triggered a worsening in my own general health. For a while it affected my own muscular system. Whereas previously I had practised and taught yoga, from doing the full lotus position, padmasana, I can no longer sit cross-legged on the ground. 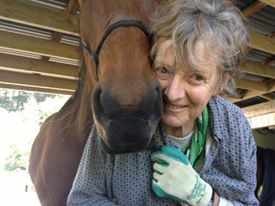 From several day tramping trips (trekking) in the forests and mountains I now rely on my partner Pam to make the trek up the hill to fetch the horses. 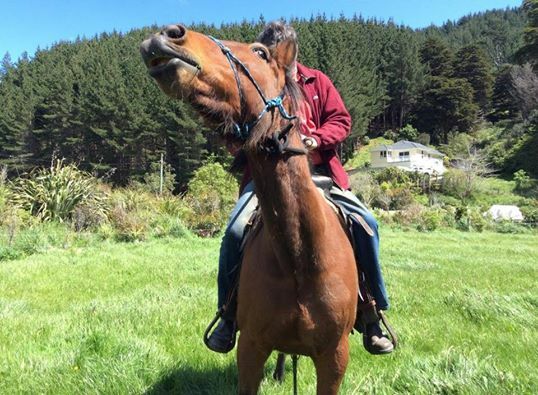 I have sometimes found it difficult to mount Biscuit, to swing my leg over into the saddle and have had to give up in frustration. Biscuit has shown all the signs of understanding my predicament and has shown much patience, standing still while I make efforts to get on his back. It's always worth the effort because once on I become a different human being and we can enjoy time together and practise some of the things that he has taught me and that I have demonstrated to him that he can achieve that he couldn't before. He has become, all at once, my therapist and enabler who makes things possible. We've had such fun together and he has got me out. This is what I really miss. But I savour the times when Pam comes up the hill for Lucy and I. Sometimes I feel here coming and I wait for her to come and get us. Often it's just the little pleasures of being brought in and given a good feed and generally being made much of. Even when he plays around with my feet I enjoy it. Here I'm spending some time with Pam. Here we are, off for a splash in the stream and a short trip back to the paddock. No, I don't think we'll do that. BACKWARDS,BACKWARDS! On my meanders through Leeston I meet few other inhabitants other than the odd dogwalker walking an odd dog. Yesterday I walked towards the east where I met a lonely but friendly equine on his M.M (editor’s note M.M = Molly Malone= alone). At the end of my story horse on M.M said, “heck, what a great story. I wish I had somebody to tell it to but I am on my M.M. I haven't seen Robin for a long time but he reappeared bearing gifts. I was so pleased. I'm sure he's got something! 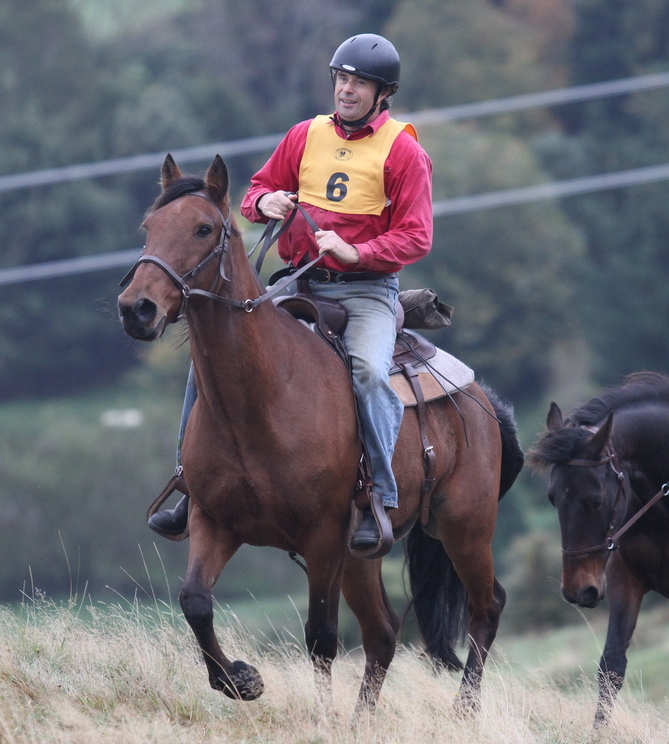 Like Robin Richard needs some practice getting in and out of the saddle. Not bad at 87!